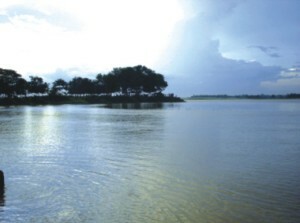 View of the Padma River. The time is nigh to take a vacation, especially since the first day of school is right around the corner. As much as we pretend that we have been anticipating sending those pesky little brats off to their respective educational institutions, privately we know we will miss them when they're bogged down by chemistry lessons and the like. So what better way to cherish every moment of the kids' last days of freedom than a vacation? And of all the lush locales in Bangladesh to visit for a last minute trip, Kushtia in particular is quite nice at this time of the year. Previously, travelling to Kushtia meant going through the hardship of at least an hour-long ferry ride, which I personally always enjoyed, though I can imagine it to also be a nuisance for some. However, now, with the Jamuna Bridge, the route to Kushtia is clearer than ever--so clear, in fact, that the journey from Dhaka only takes about four hours by bus, of which there are several that regularly run the Dhaka-Kushtia route. Of course at the same time, one should be forewarned that tickets sell quickly. I, for example, booked my tickets rather late and ended up on a non-air conditioned bus, which needless to say, considering the time of the year, was more than a bit warm. Actually, the weather in Kushtia overall is much like that of Dhaka, although the sun feels warmer, and it rains with greater intensity in the afternoon. I thought there were definitely more mosquitoes out west though, so be sure to pack extra insect repellent. The thriving mosquito population may have something to do with the fact that Kushtia lies on the banks of the Padma River, providing ample breeding grounds for the flying pests. That aside, the views from the river are spectacular. The water is a pristine blue that reflects the colours of the sky, absolutely nothing like the tributaries in Dhaka, which seem permanently to be stuck at a horrific murky brown shade. And from one bank of the river, it is possible to look all the way downstream and across to the verdant farms at the opposite bank. During such a viewing, I witnessed what I thought at first to be a sort of melee downstream from me. Hundreds of people had gathered on one of the many hills that line the bank of the river and from them, I could hear a rhythmic beat like that of a drum. After speaking with a few local people, I discovered that the gathering was actually a regular occurrence. Apparently every Friday at about sundown, there is a celebration for the end of the week where everyone gets together to sing and dance while enjoying the river's scenic views. Following my jaunt to the water, I walked through Kushtia's main city, which is remarkably clean, probably because very few Kushtians drive cars, opting instead for motorcycles, rickshaws, and vans. I enjoyed my first van ride then, cruising--as well as one can when sitting on a wagon-type apparatus while being pulled by a much too thin man on a bicycle--past the monuments commemorating the events of 1971, located at various junctions in the city. I also stopped to shop for inexpensive Indian saris at Majarhat Road, which is Kushtia's main marketplace. After a night spent under an unpolluted sky dotted with stars, the next day was spent visiting Shilaidaha, Rabindranath Tagore's vacation home, and Lalon Shah's mausoleum because a trip to Kushtia isn't really a trip until one has gone to those two sites. At Shilaidaha, I listened to some lovely Rabindra Sangeet music while walking through the gardens and eating kulfi, sold on banana leaves. I must admit, however, that the inside of Shilaidaha was not particularly interesting; on display was Tagore's bed and some of his artwork.The exterior of Shilaidaha and the grounds more than made up for the disappointing interior, however. Lalon Shah's mausoleum. Shilaidaha, Rabindranath Tagore's vacation home. Lalon Shah's modern-day followers. A gathering of people listening to Rabindra sangeet. On the other hand, Lalon Shah's mausoleum also had a nice assortment of hippies sitting outside to serenade the visitors, but because of their soothing hymns, I felt inspired to buy a flute at the market beyond the gates. When I was younger, I had found the musical troubadours to be a bit scary--their messed hair and cavalier attitude toward personal hygiene never exactly translated to being friendly, but this time, I was so moved by their music, I too want to make music. Of course, I have never officially had any sort of musical instruction, but with every incorrect note I play, I will think a little bit about Lalon Shah and my time at his mausoleum. And with those thoughts, I will naturally remember my trip to the musical, warm, glorious Kushtia.